Revolutionary new lashes with a deep Americano tone, perfect for clients with dark and fair colouring.These super lightweight, new lashes are the luxury necessity for your lash collection that you and your clients will adore! 0.05 Mega Volume extensions are super soft and light. Ideal for creating Glamorous Russian Volume sets! This multi pack will help you to create absolutely amazing glamorous looking eyelashes! These lashes are easy to fan! Specially developed formula makes these lashes super easy to fan and make them resistant to bending. This is a great product for highly experienced volume lash artists who are comfortable working with fuller than 6D fans. These multi length packs are ideal for mobile therapists or lash artists that just want to try our new London Lash eyelashes. Buy a couple of these and you're covered for a wide range of looks without the need to invest in or carry around lots of different packs. 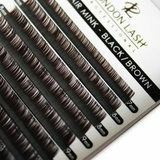 Need advice about 0,05 Mixed Size Black Brown Mayfair Mink Lashes C/CC/D?